January 20, 2011 January 14, 2018 P.O.P. So the Supreme Court delivered its suspenseful ruling, which in fact was really no surprise to anyone. And George W. Bush was sworn in as the 43rd President. God was in his heaven, and all was right with the world. Except that a lot of people still wondered who really would have won in Florida if the Supreme Court hadn’t come riding over the hill just in the nick of time. So, with the supposed objective of setting the matter straight, a consortium of eight news organizations sponsored a painstaking review of the ballots that were rejected. (At least all they had available. Thousands of them, mostly from heavily Democratic precincts, were mysteriously MIA.) Conducted by the University of Chicago’s National Opinion Research Center and closely monitored by representatives of both political camps, the review tallied the likely outcomes under several different counting standards. “Florida Results: Ballot Review Shows Bush Retaining Lead” blared The Miami Herald. “An Analysis of Florida Balloting Favors Bush”, offered the “ultra-liberal” New York Times. “Bush Really Won”, declared the New York Daily News. “Recounts in Miami-Dade Finds Bush a Fair Winner”, proclaimed the “ultra-liberal” Los Angeles Times. 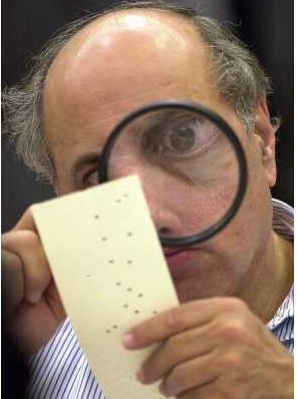 “Florida Vote Review Confirms Bush Won; Recount Would Have Left Gore Short”, exulted The Houston Chronicle. “Yet Another Recount Says Bush Won”, gloated the Tampa Tribune. “Newspapers’ Review Shows Bush Still Winner”, boasted The Arizona Republic. “Bush Still Would Have Won After a Recount in Florida”, announced the Pittsburgh-Post Gazette. “Undervote Review Says Bush Won”, piped the Dayton Daily News. Wow. Pretty unequivocal, huh? Surely nobody still could harbor doubts about Dubya’s triumph after reading headlines like those. Ah, but there’s always the troubling fine print. And in this case, it was very troubling indeed. Anyone who bothered to read past the headlines and get the full story – which usually was buried somewhere in the back of the paper – found a very different conclusion. It turns out that Bush’s “victory” would have been attained only under a few partial-count standards, which the headlines all focused on. But under any counting scenario involving a statewide recount, GORE WOULD HAVE WON. Let’s repeat that: under any scenario involving a STATEWIDE RECOUNT, Gore would have won. Once more: Under ANY SCENARIO involving a statewide recount, Gore would have won. Yet the media consistently, almost universally, spun this into an incontestable victory for Bush. Perhaps the eeriest example was The Washington Post, which touted a front-page headline proclaiming “Florida Recounts Would Have Favored Bush”. But buried on page 10 was a box listing the consortium’s actual tabulations under the heading “Full Review Favors Gore”. Such schizoid self-contradiction was by no means unique; it was the media norm. But what makes the Post’s account even eerier is that it was accompanied by media critic Howard Kurtz’s gloating editorial (“George W. Bush, Now More than Ever”) in which he haughtily dismissed as “conspiracy theorists” those who pointed out such inconsistencies, and noted that they were “convinced that the media were covering up the Florida election results to protect President Bush” – which is precisely what his own paper was doing right under his nose – and insisted that such kooky notions had been “put to rest” by the consortium review. One explanation offered was that due to the recent terrorist attack, people were hesitant to say anything that might undermine national unity. It was more patriotic, some believed, to blindly follow a national leader in time of crisis, even if illegitimate and incompetent, than to expose and correct flaws in the democratic process. But perhaps a more accurate explanation was that they simply didn’t want to rock the boat – heaven forbid that the media ever be guilty of such a thing. Apparently expecting to verify a Bush victory when they undertook the whole undertaking, they stuck with that story later, facts be damned. In a statement expressing strong dissent to the majority Supreme Court ruling in Bush vs. Gore, Justice Stevens wrote, “Although we may never know with complete certainty the identity of the winner of this year’s Presidential election, the identity of the loser is perfectly clear. It is the Nation’s confidence in the judge as an impartial guardian of the rule of law.” He might have added the same for the Nation’s confidence in the media to cover events and issues fairly. Its slanted reporting of the consortium review may have been the final nail in the coffin of American mainstream media. At least, there certainly has been no indication of miraculous resurrection since then. 1.People read and remember headlines. Not stories. 2. Go on the attack early, and stay on the attack. 3. Find an unsavory label for your opponent, and keep hammering away at it. It doesn’t have to be an honest label. 4. We live in a visual world. People remember and accept what they see more readily than what they hear. 5. People will believe anything they hear if it’s repeated often enough. And then there’s the most important lesson of all, though it’s not necessarily connected directly to propaganda: the best way to get ahead in the world is to have good connections. But chances are you already had that one figured out a long time ago. Previous So Why Are They Blaming the Nice Little Tea Party for Those Nasty Shootings? Next What Would We Do Without Hitler?